I’m officially a 4th year medical student now – it still doesn’t seem real! Less than a year from now I’ll be graduating =). So of course to celebrate, we had to have friend time…and cupcakes! 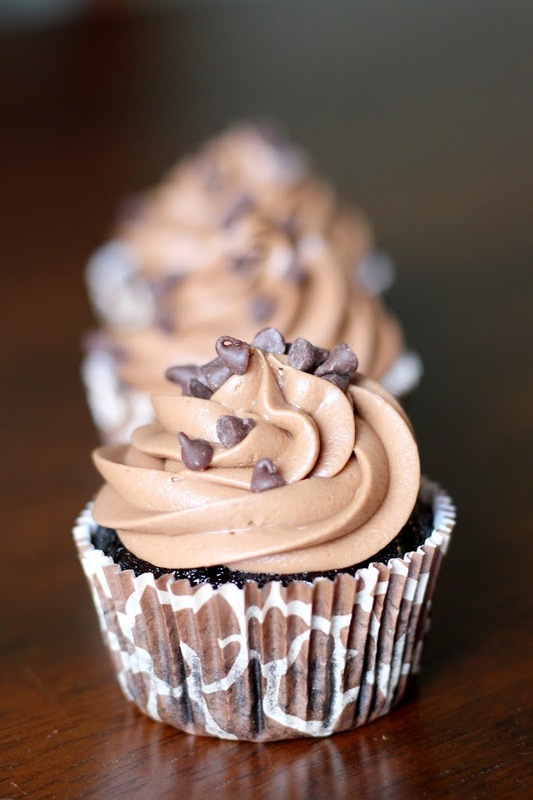 I was trying to decide what kind to make and I thought about these cookie dough cupcakes – the very first cupcake I posted on my blog. But I can’t blog about the same cupcake twice, so I thought I’d switch it up and make them brownie batter…um, yeah…it’s as ridiculous as it sounds. And by ridiculous I mean the best thing ever ;). I started with the same chocolate cupcake, but instead of freezing scoops of brownie batter and baking it in the cupcake batter, I just made a brownie batter filling. It’s basically just an eggless cookie dough/brownie cross (how can that be bad??) =). 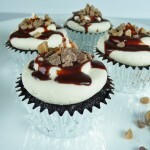 And then I topped them with a chocolate cream cheese frosting – delicious! They were definitely a hit – 12 hours later they were ALL gone. I took some quick pictures while my friends were here and then later went to edit them and realized the white balance was off and I just wasn’t happy with them. I had sent all the cupcakes except 3 home with my friends, but I went back to the kitchen thinking I’d just take some pictures using my light set (because it was dark) only to discover that someone (Jordan) had eaten the one I had already cut in half. Only 2 remained. I cut another one in half, but it kind of crumbed a little while I was positioning it so I was down to one…and then I just gave up! Food photography is a lot of work =). Enjoy! 1. Adjust oven rack to middle position and heat oven to 350 degrees. Line standard-size muffin pan with baking-cup liners. 2. Place chocolate and cocoa in medium bowl. Pour hot coffee over mixture and whisk until smooth. Set in refrigerator to cool slightly, about 5 minutes. 3. Whisk flour, sugar, salt, and baking soda together in medium bowl; set aside. 4. Whisk oil, eggs, vinegar, and vanilla into cooled chocolate-cocoa mixture until smooth. Add flour mixture and whisk until smooth. 5. Divide batter evenly among muffin pan cups. Bake until cupcakes are set and just firm to touch, 15 to 17 minutes. Cool cupcakes in muffin pan on wire rack until cool enough to handle, about 10 minutes. Carefully lift each cupcake from muffin pan and set on wire rack. Cool to room temperature before frosting, about 1 hour. 2. 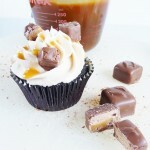 Beat in the flour, sweetened condensed milk, melted chocolate, and vanilla until incorporated and smooth. Stir in the chocolate chips. 3. Cover with plastic wrap and refrigerate until the mixture has firmed up a bit, about an hour. Note: I only used about half the filling. Next time I’ll probably half the recipe. 1. Combine butter and cream cheese in mixing bowl and cream on medium-high speed until light and fluffy. 2. Gradually beat in powdered sugar. Continue to beat for about a minute. 3. Add melted chocolate and beat for about 30 seconds more. Add whipping cream, if necessary, and beat 1-2 minutes more until very light and fluffy. 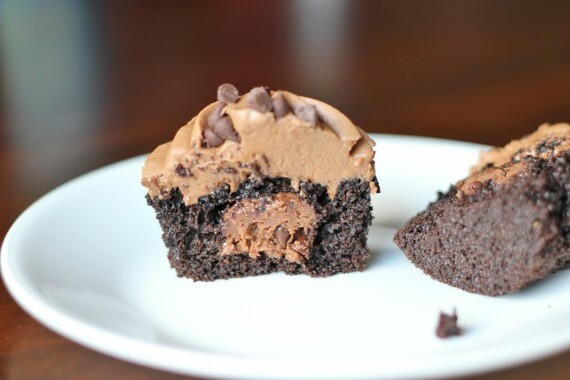 To assemble: Using a small knife, cone out the center of each cupcake. Fill hole with about a teaspoon of the brownie batter filling. Replace top of cupcake. Frost filled cupcakes as desired and garnish with mini chocolate chips.